Each person participating on the Officiating Team must have taken the course for the duty they perform. It is recommended that all Junior players take at least two of the four courses so that there is adequate coverage for all positions at tournaments. The club may establish policy to require all four courses. Optional advanced training is available for interested Junior players. For more information on this program click here. 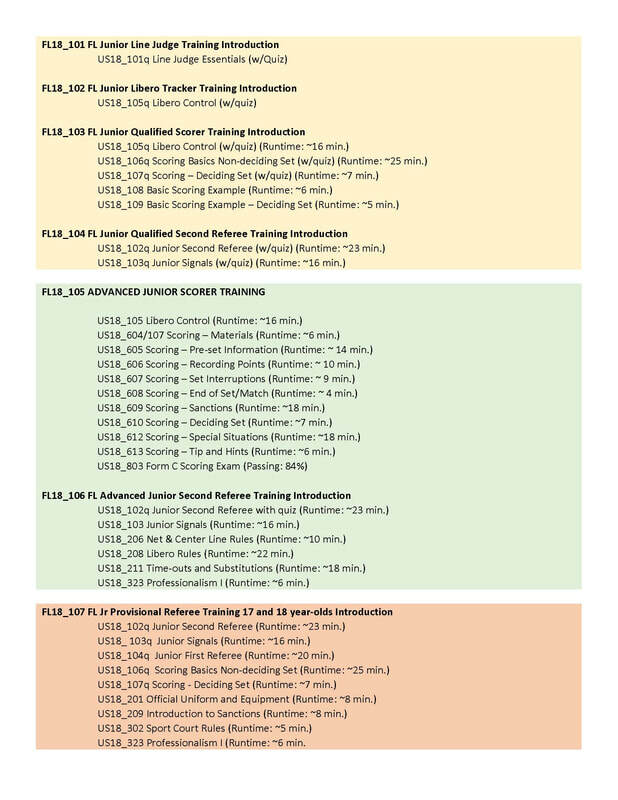 This certification level is for those junior players who enjoy officiating and wish to enhance their skills and knowledge through more in-depth training. DO NOT REGISTER for ADVANCED SCORING / SECOND REFEREE and QUALIFIED SCORING / SECOND REFEREE. CHOOSE ONE OR THE OTHER. 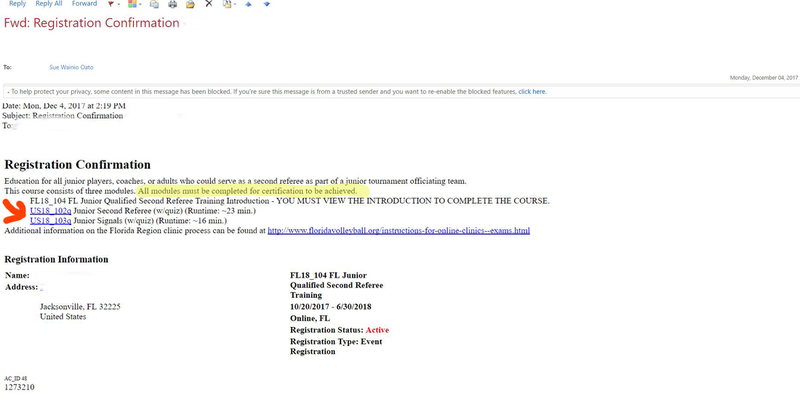 IF YOU REGISTER FOR THIS COURSE IN ERROR, PLEASE EMAIL SUE@FLORIDAVOLLEYBALL.ORG AND ASK TO BE REMOVED. Please note that most of these courses contain multiple modules and all modules must be completed to achieve the certificate for the course. The details of modules included in the course will be shown during the clinic registration process. Click on Region Ref/Score clinics under the Events tab on the left side of the screen. Click on the Register Now button to the right of the clinic you wish to take. At this point, you will leave Webpoint and go to USAV Academy to access your course(s). Click the Login to USAV Academy button to access your course materials. Doing this will synchronize your USAV Academy credentials to match your current Webpoint login information. Each online training COURSE consists of EDUCATIONAL MODULES. There are two systems that handle the training. USAV's Webpoint database keeps track of your registrations and certification. USAV Academy is the Learning Management System that contains the educational content (the stuff you are there to learn!) The INTRODUCTION (such as FL19_101) ties your registration and activity back to your record in Webpoint. 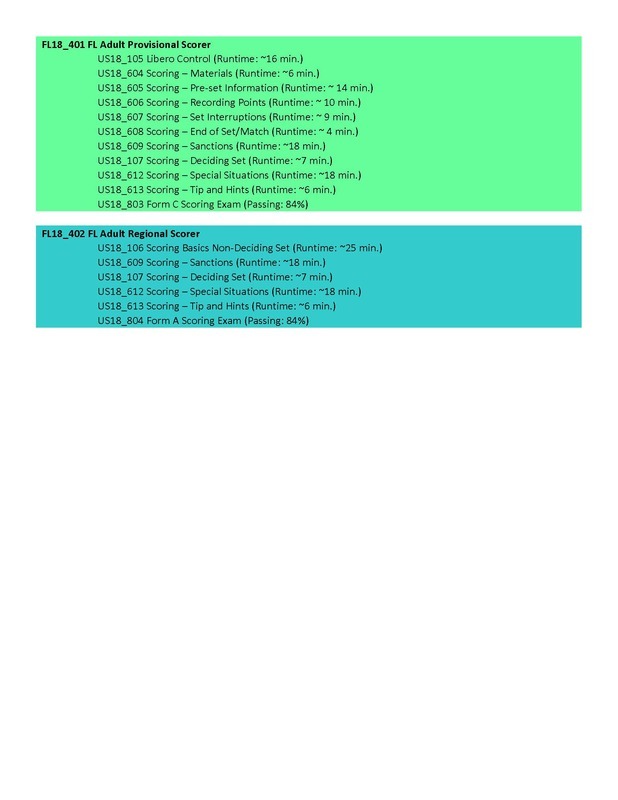 The MODULES (US19_105q, for example) are the actual educational materials you need to complete. 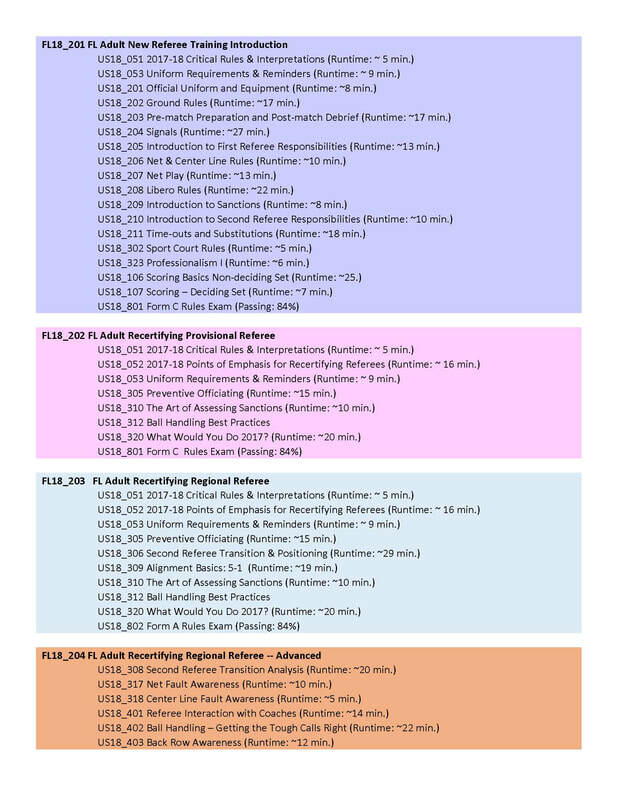 When you register for a COURSE (FL19_104 for example) you are automatically enrolled in all the MODULES that make up that COURSE. So, to complete one course, you may need to complete two or more MODULES. You will receive an email with that information when your register. It will tell you which MODULES are included in your COURSE. You must finish all the MODULES in order to achieve your certificate for the COURSE. You do this by clicking on all the green "GO" buttons in your learning activities area. Once you are done with a green "GO" button, it will turn grey and move to the lower portion of the screen.